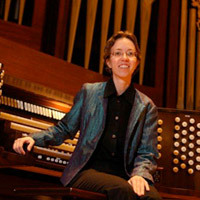 Isabelle Demers is Associate Professor of Organ at Baylor University, where she teaches applied organ and other courses in the organ curriculum. Dr. Demers holds the BM in piano and organ from Le Conservatoire de Musique de Montréal, as well as MM and DMA from the Juilliard School, where she studied with Paul Jacobs. Her doctoral work on Bach's St. John's Passion received the Richard French Prize for best dissertation at commencement. Professor Demers concertizes widely in North America and Europe; recent engagements include the cathedrals of Cologne and Regensburg in Germany, St. Paul’s Cathedral and the Royal Festival Hall in London, the Royal Opera House of Muscat (Oman), Auckland Town Hall (New Zealand), Melbourne Town Hall (Australia), as well as major universities and concert halls in the United States, among them Davies Hall (San Francisco), Disney Hall (Los Angeles), the Kimmel Center (Philadelphia), the Wanamaker Organ (Philadelphia), Yale University, and the Eastman School of Music. She has recorded four CDs for the labels Pro Organo and Acis, with three more projects currently in production.